It is now a fashion to post Instagram pictures in a fancy style instead of merely beautiful. For this purpose, one of the smartest tricks is splitting a single picture into gird and posting it on your Instagram page. 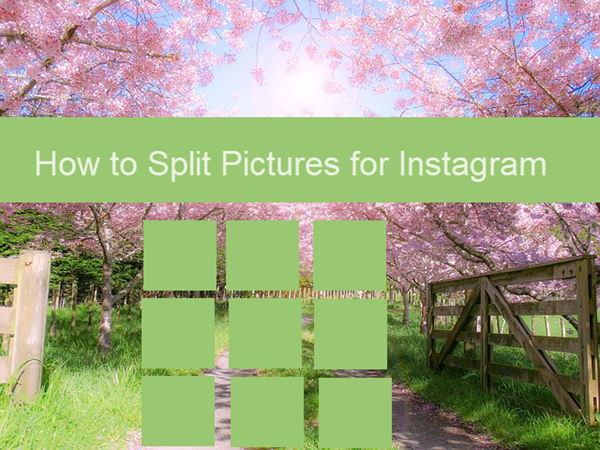 In this article, you’ll know exactly how to split pictures on Instagram into grid and make a giant square. You may have seen it several occasions such as how individuals post nine unique pictures on their Instagram profile. What’s more, when you visit their page, you’ll see that nine distinct pictures consolidated to indicate one single picture. After reading this tutorial, you will find there is nothing secret behind. Nevertheless, it should be noted that you should also keep your precious photos safe. In case some of your important images and videos get lost, don’t hesitate to get them back with a free photo recovery software. The most effective method to split pictures on Instagram is surely utilizing some handy apps on Android and iOS devices. It is well-known that mobile apps are growing fast, so you should be not be surprised to find so many apps for splitting pictures on Instagram. Don’t worry! We are here presenting you some of the best Instagram grid apps. Open 9Cut For Instagram and select the photograph that you want to split. You can choose up to 5 kinds of framework and 3×3 works best for giant square pictures. Drag the grid to your picture and select the type of grid you need to compose. When you are done selecting click the option on the upper right. This app partitions your photograph into nine pieces so that you can share them one by one on your Instagram wall utilizing the Share button. It’ll post your picture in a sliding request in order to get the correct picture in the network. In this manner, utilizing 9Cut For Instagram, you can make wonderful Instagram grid images. Along these lines, you can tile a photograph on your Instagram profile. Simple picture splitter for Instagram. Cut any image into 3*1,3*2,3*3,3*4,3*5 cuts. Zoom or move your pics. Transfer the final photograph to Instagram specifically. Simple to utilize and intense. Save images to SD card. Not fully satisfied with 9Cut For Instagram? 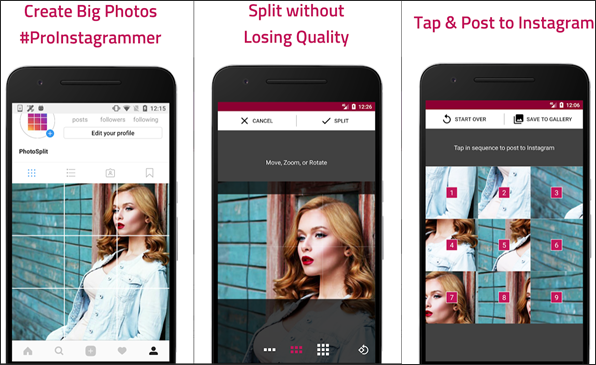 The following are more apps for splitting pictures on Instagram in easy steps. 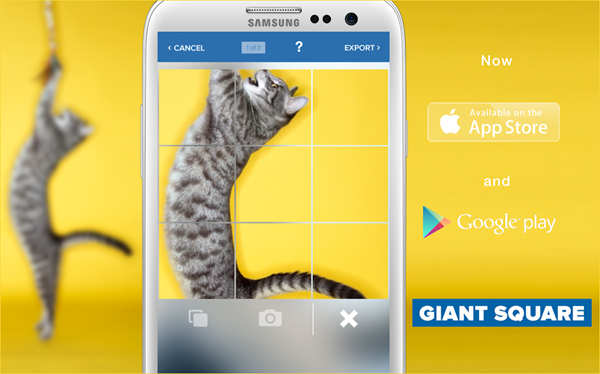 Giant Square gives you a chance to do astonishing things with your Instagram, Twitter and Facebook profile. Regardless of whether you need to part your photograph into 9 pieces or 12 pieces, Giant Square is the one of the best Instagram grid apps to do it. Make huge pictures and banner pictures on Instagram. Specific feature to fit a giant picture. Share finished photograph to Instagram with one click. Split pictures into 3×3, 3×4, 3×5. 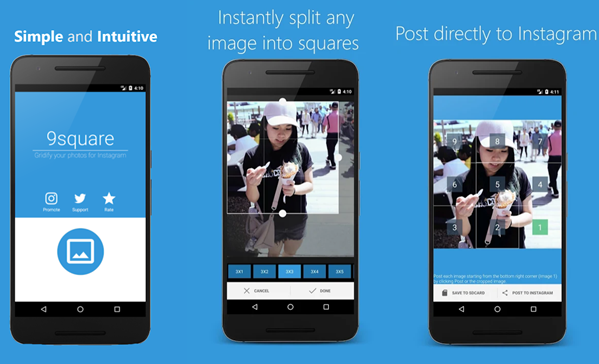 PhotoSplit is an incredible application to part your pictures into a grid and post to Instagram directly. You can undoubtedly make a big square utilizing this application. Split an image into a 3×1, 3×2, or 3×3 grid. Keeps pictures in high quality after splitting. Upload pictures to Instagram directly. Save pictures on your phone. 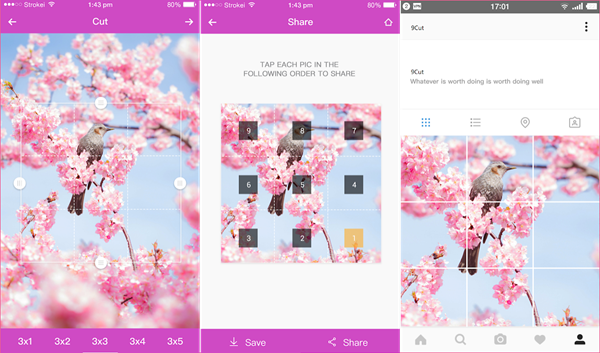 9Square for Instagram is another free Instagram grid app for splitting your Instagram photos into 3×1, 3×2, 3×3, 3×4, 3×5 grid. It also has some features that may attract you. Crop any image into 3×1, 3×2, 3×3, 3×4, 3×5 grids. Share pictures on your Instagram profile or stories. Split pictures on a horizontal way and vertical way. These are many more applications which can split image for Instagram. You can even find some online tools to split Instagram pictures on PC. Anyway, the above 4 Instagram grid apps are good enough for personal or business purpose. If you find any more interesting tips & tricks about Instagram, like saving Instagram photos on iPhone or No crop apps for Instagram, please kindly share with us.